How do I get tags to show alphabetically on the web portal? Select Tags under 'Configurator' on the web portal. 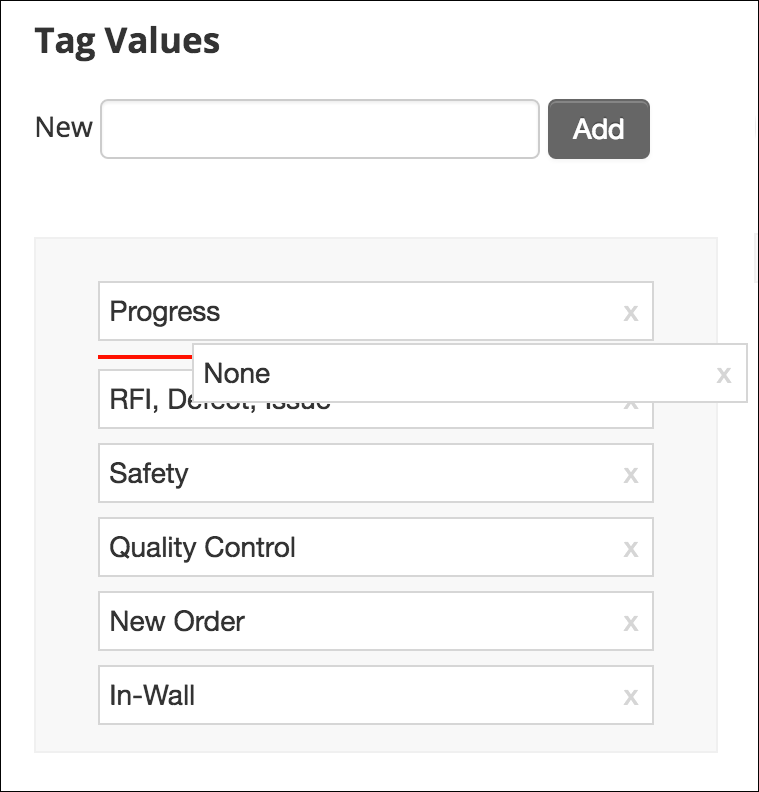 You can rearrange the order of the tags by dragging and dropping the tag values to the desired order. This order will also display in the mobile app. How do I set a tag category to single-select, multi-select, and/or required? Here you can select whether the new tag category will be single-select, multi-select and/or required. Here you can change the name of the tag category and update the tag category settings. How do I create dependent tags? Select the tag category and the corresponding tag value you would like to create a dependency for. This category will become the parent category. Open the drop down list under ‘Dependent Tag Values’ and select the category that you would like to make dependent. Then, select the tag values you would like to assign to the new parent category and click Save Changes. For example, Unit A only has 3 rooms but Unit B has 5 rooms. To ensure that photos taken in Unit B can be tagged ‘Room 4’ or ‘Room 5’, make these values dependent to tag category 'Unit' and value 'Unit B'. How can I set a tag value as the default tag? Under ‘Tags’ on the web portal, click on the tag category you would like to set a default value for. Then, right click on the value you would like to set as the default. When you capture a photo on your mobile device that tag value will automatically get assigned as the default value. How do I add a new folder to my filing hierarchy? Under the ‘Configurator’ on the web portal, you can manage your filing hierarchy for your storage account by clicking on Filing. To add an existing folder from the ‘Folders Not In Use’ column, drag and drop the correct folder into the ‘Folders In Use’ column. To create a new folder, type in the name of the desired folder where it says 'New Folder'. Click Save and the new folder will appear at the bottom of the ‘Folders In Use’ column. You can drag and drop the folder within the column to rearrange the order. How do I delete a project? And what happens to those photos? Select Projects under the 'Configurator', here you have access to all of your company's projects. To delete a project, start by clicking the X icon to the right of the project. You will be asked to confirm. What type of answer options are there for creating report templates? Aside from 'Photo' answers, all answer types have the option to add photos and/or comments to the question. 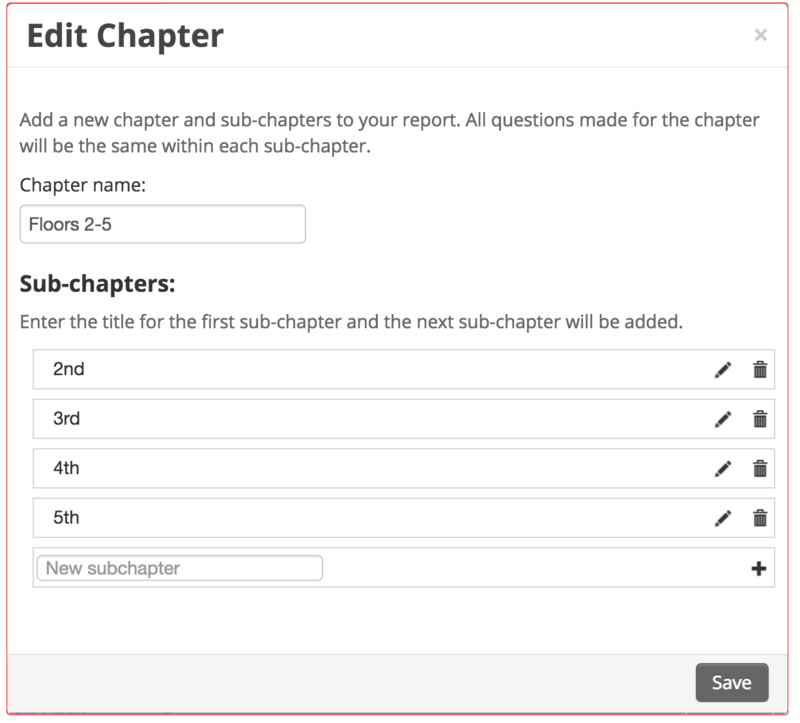 Sub-chapters are sections within each chapter of your report. If you are asking the same set of questions multiple times, you would create sub-chapters within that chapter. This way you do not need to re-create the same questions multiple times. For example, a report template for a building inspection could have a ‘Floors’ chapter with ‘1’ - ‘10’ as sub-chapters, all containing the same questions. How do I add questions to a sub-chapter? Once you have added a chapter and possible sub-chapters, make sure that chapter is highlighted red before proceeding. Click Save at the bottom of the pop-up window to save that question to that chapter. Follow the above instructions to add as many questions as you’d like to that chapter. Any questions you add to the chapter will be added to the sub-chapters automatically. How can I save a report template to finish working on it later? This will save your progress so you can come back at any time to finish or edit the report template. How do I get my report template into the FotoIN app on my mobile device? Once you are finished configuring your report template on the web portal, make sure the correct report template is highlighted red under the ‘Templates’ section. Then, click Publish in the top right. This will publish your report template to your FotoIN account so mobile users can access the report from the FotoIN mobile app. How can I get company data out of FotoIN? Under the ‘Data’ tab, you will find all of your company’s data that was captured in the field. This data can be exported to an excel spreadsheet. To export specific data, use the filters to search by projects, devices, users, locations, tags, and dates to get the exact data you need. Then click Export to Excel to download the data to your computer. To export all of the existing data, make sure the filters have been reset and click Export to Excel. How do I edit field reports that have been uploaded to the web portal? On the web portal, under the ‘Reports' tab you will find a Word icon next to each report. Click the icon once to download your uploaded reports as a Word document. Once the report is downloaded. You will be able to edit any of it's content. What is the easiest way to find specific photos on the web portal? Go to the 'Photos' tab and type in a keyword/s you are looking for in the search bar or use the filtering options on the left hand side to narrow down your search. Once you have applied all the necessary filters, click Apply at the bottom. To return to the full photos view, click Reset at the bottom. What happens when photos are Archived? Archiving photos will remove them from active view in the FotoIN web portal and Unarchiving photos will bring them back into active view. All photos remain stored in company’s central repository and remain searchable in FotoIN. To Archive photos, select the photos that you want to remove from FotoIN’s web portal and click the Archive button. To Unarchive photos, select photos that are labeled Archived and click the Unarchive button. These photos will once again, become active within the FotoIN web portal for users to access. The new user will receive an email which they will open on their mobile device. They will click the link to join, create a password, and then have access to your FotoIN account. Tip: Make sure the user has downloaded the FotoIN app to their mobile device before opening the email. I don’t want all of my users having access to the web portal. What are the different permission levels for the web portal? Click on the Manage icon of the user you want to edit. From here, you can edit their web and/or mobile roles. Make sure to click Save after you make the changes. How do I add a company logo to our reports in FotoIN? On the web portal under 'Configurator', you can add a company logo that will appear on all reports. Upload a .jpeg file within General Settings and sync all devices associated with your account to capture the changes made on the web portal. My photos aren’t syncing to my storage provider…why is that? This means that your storage provider connection has expired. Under ‘Admin Controls’ on the web portal, select Verify Storage Provider on the left. Here, you can verify the connection to your storage provider by clicking on the red button that says Verify. How do I setup my billing information for my FotoIN account? Once in the web portal, under ‘Admin Controls’ click on Pay with Card. Enter in the card information and click Save when you are done. I forgot my password...how can I reset it? Visit the FotoIN website and click Log In in the top right. At the bottom, click on Forgot your password? From here, you can reset your password. Tip: Remember, you will need to log back in on the mobile app with your new password. Can I speak with someone about my issue? If your company’s plan is setup to include phone support, you can contact us at: 678-506-7080. Alternatively you can contact us by email or fill out a form. Include your phone number and we'll be more than happy to give you a call. Please include as much information as possible about the issue you are experiencing. Copyright © 2018 FotoIN Mobile Corporation. All rights reserved.